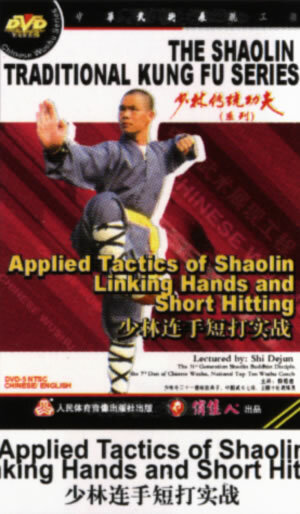 Shaolin Linking hands and short Hitting called also Shaolin Body-protecting quan. Its movement is extending with firmness and softness, contents both defending and attacking. When demonstrating it, step comes with hands, the change of body is variety, the posture is linking, one by one, when attacking enemies, we take advantage of goring by shoulder, striking by head, fighting by elbow, depending by hip, stumbling by feet, catching by hand, and hitting by fist, etc, shows completely the perfect points of kicking, hitting, throwing and catching, is a rare routine.